Remove the ice cream from the fridge for 30 minutes to let it thaw. Use a food processor to crush the Cheerios™ until you've got crumbs. Use the pulse setting to create different sizes. Pour the Cheerios™ into a bowl, add the sugar and stir well. Add the melted butter and distribute evenly. Place half of the ice cream in a pound cake mold. Add 4 tablespoons of cajeta. Add the rest of the ice cream and more cajeta. Place in the freezer for 15 minutes. Remove from the fridge and use a fork to bring out the streaks of cajeta. Serve with the Cheerios™ sprinkled on top. You can use other ice cream flavors: Coconut, chocolate, mango, etc. If you like cajeta ice cream, but have a hard time finding it where you live, this recipe is for you. 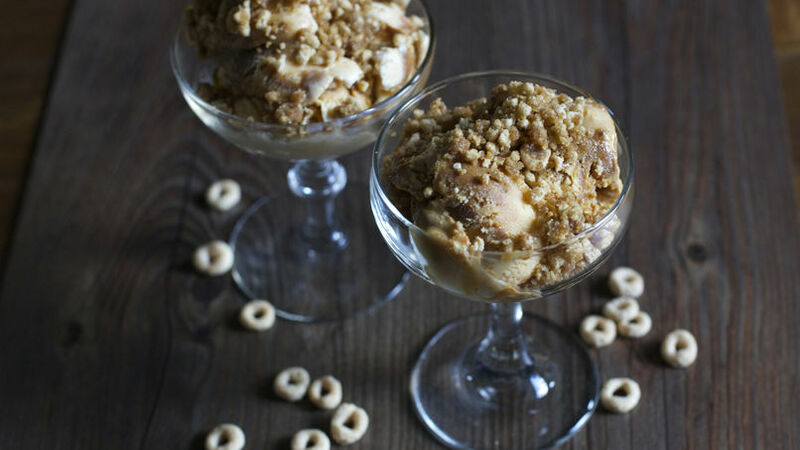 Crunchy Cheerios™ complement this delicious ice cream and help make this recipe very special. Surprise your family with this delicious dessert.